Join Us For Our Annual Meeting this January! AND APPLY FOR OUR NEW PROJECT MANAGER POSITION! 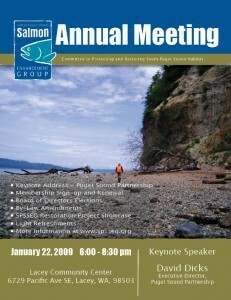 Every January SPSSEG hosts our annual membership meeting. Of course, you do not have to be an SPSSEG member to attend this FREE EVENT. All are welcome to come enjoy refreshments, an SPSSEG restoration project showcase, and our keynote speakers! Become a member to vote in new Board of Directors members and vote on amendments to our bylaws at the meeting. By being a current SPSSEG member you are also eligible to elect up to three new members to the Board of Directors at the 2009 Annual Meeting. Click here to learn more about serving on the Board of Directors. 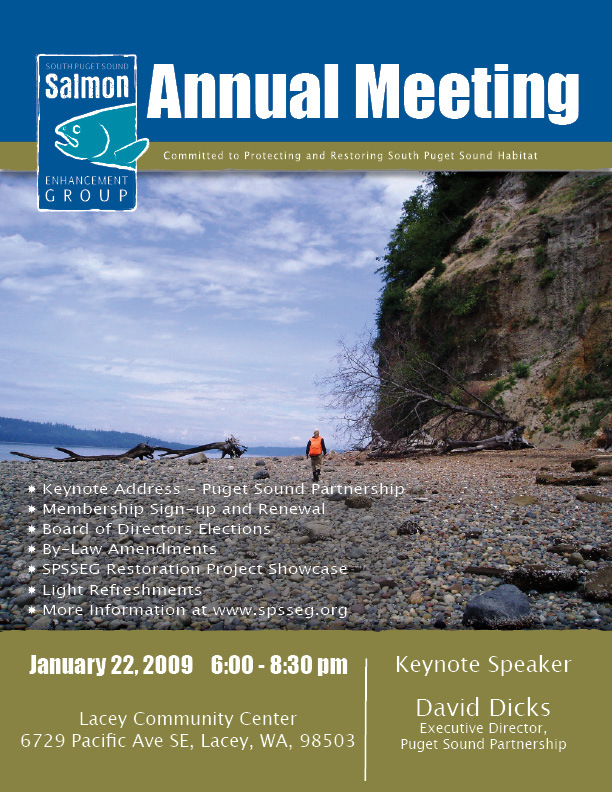 Our keynote address speakers this year are Billy Frank Jr., the Director of the Northwest Indian Fisheries Commission and David Dicks, Director of the Puget Sound Partnership. David Dicks is the Executive Director of the Puget Sound Partnership. Prior to his appointment to the Partnership, David was a partner at Cascadia Law Group PLLC, where he focused on Puget Sound issues, natural resource projects and facilitated the development of numerous Habitat Conservation Plans under the Endangered Species Act. He has earned national recognition as one of The Best Lawyers in America (2007 and 2008). He has also been recognized as one of Seattle Metropolitan’s 2007 Best Lawyers, and has been named a Rising Star by the readers of Washington Law & Politics magazine every year since 2005.